“It is always with excitement that I wake up in the morning wondering what my intuition will toss up to me, like gifts from the sea.” This beautiful image comes from Jonas Salk (a Scorpio), who developed the first polio vaccine; it portrays the Scorpio’s ability to access their intuition and to allow what lies deep inside them to come up to help the rest of us. As other water signs, Scorpios have the ability to live in two worlds, under the water or above, and to keep a part of themselves hidden. The surface of the water reflects what is looking into it, so remember when talking with Scorpios that you see your reflection, but this doesn’t mean you see them. Since we all love to get ourselves back, you’ll find that you actually like to talk with them. Their need for privacy is intense, and they are willing to pay the price of not being the most popular person around in order to keep this private space. This intense inner process also makes them prone to self-doubt, and in order to not use the scorpion stinger against themselves, they need to find a purpose to work for and to be constantly updating and transforming themselves. 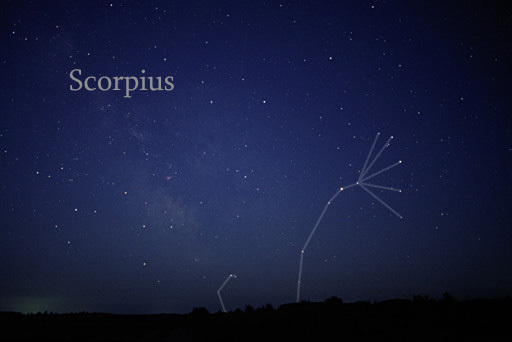 In some mythologies, the symbols related to the sign of Scorpio are both the snake and the eagle. This gives us another hint at the transformational journey of development that Scorpios go through; always trying to reach the higher, the less personalized viewpoint that is seen from the heights only eagles can reach. The ancient ruler of the sign, Mars, speaks of the fierceness they can sometimes demonstrate, and the new ruler, Pluto, the Roman god of the underworld, gives another inroad into the dark, where changes can happen. “Dark” in Scorpish does not translate to “bad,” but to “not yet understood” or “need to find out more.” Scorpios are not afraid of the dark, and they sure would like to know what’s in it. This tendency may make them sometimes dangerous to themselves, but if possessing a strong foundation, they can come back to us with important revelations of what’s in the dark and how to maneuver the way toward the light, making them very good psychiatrists and other scientists in search of truth. if somehow they manage to find or fashion a path that they feel good about, they can then be very tolerant and helpful. Pluto, the ruler of Scorpio, has been in Capricorn since 2008 and will stay there until 2023. In October of 2012, Saturn, the ruler of Capricorn, moved into Scorpio for two years. This exchange of rulers will affect all of us (especially because Pluto is involved) but will give the Scorpios in particular a good chance at totally transforming their lives and creating new foundations and frameworks for the future.